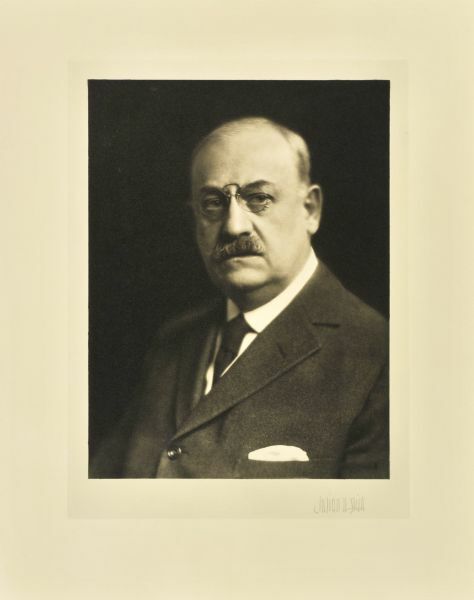 In 1913 well-known Milwaukee portrait photographer, Simon L. Stein, contacted the Society with a plan. He proposed to donate around 500 portraits of leading Wisconsin citizens, those "men and women who have attained a position of sufficient prominence in various walks of life," to the Society along with detailed biographical information that would be of practical use for genealogists, historians, or any other person interested in those Wisconsinites who had "left footprints of intrinsic value." Because he wanted to provide a collection that future generations would find useful and inspire pride in the state's heritage, Stein promised to make the portraits "in the most artistic manner I know." 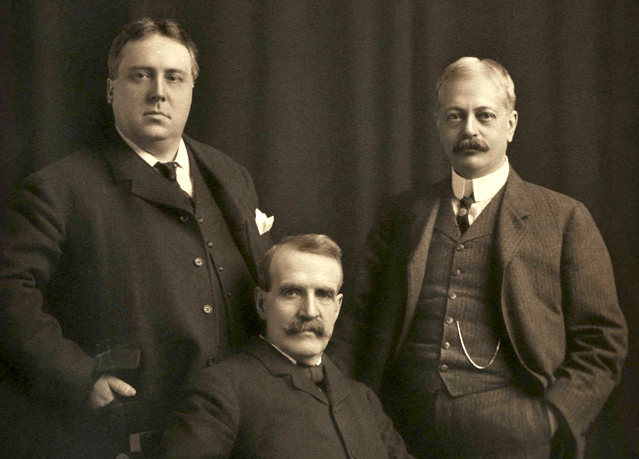 In outlining his plan to then-Society Director Reuben Gold Thwaites, Stein proposed donating the photos of these leading citizens, most residing in the Milwaukee area, over a period of time. Prior to his death in 1922, Stein donated a total of 382 portraits. His son Julian continued his father's work, contributing another 47 to the collection before his death in 1937. The majority of the photographs consist of handsomely lit and composed head-and-shoulder-style portraits, with occasional full-length shots. The prints are of exceptional quality on heavy photographic stock. Most are signed below the portrait by the subject. Among those depicted are Neenah manufacturer F.J. Sensenbrenner, educator Ellen Clara Sabin, physician Horace Manchester Brown, and Milwaukee Judge Adelbert J. Hedding. Most date from between 1902 and 1937. To add value to the portraits, he prepared a form soliciting biographical details from his subjects and attached it to the back of each print. Information requested included date and place of birth, when they came to Wisconsin and where they settled, where they were educated and any degrees, public or military service, date and place of marriage, and name of spouse, names of children, occupation, address and remarks. Only a few portraits are missing this information. Anyone who orders a reproduction of one of the Stein portraits will receive a copy of the attached biographical sketch at no extra charge. Born in Austria in 1854, Simon Leonard Stein immigrated to the United States in 1866 after the untimely death of his parents. He settled in Chicago, where he studied under photographer A.J. Lawson before relocating to Milwaukee. There, he took a new position retouching photographs for Hugo von Broich, eventually purchasing the studio of Broich and Cramer in 1879 and opening the S.L. Stein Studio at North Third Street and State. During his career, Stein's work won 29 medals in exhibitions ranging from the Exposition Universelle in Paris and the World's Columbian International Exposition to the Louisiana Purchase Exposition and the Pan-Pacific International Exposition. He also served twice as president of the Photographer's Association of America. Additionally, Stein helped to perfect the Lumiere and English color plate process and discovered a way of printing photographs directly on various metals, including gold, silver and bronze, developments that greatly influenced the industry. Despite such contributions to the developing world of photography, however, Stein was a portrait photographer by trade. He produced prints of exceptional quality, so much so that prominent individuals from across the nation took note and requested that he take their portraits. Stein's son Julian was born in Milwaukee in 1883. Working under various photographers from St. Louis to Cincinnati, Boston, and New York City, Julian returned to Milwaukee in 1920 to take over his father's studio when Simon's health began to fail. Julian continued his father's legacy of superb portrait photography until his death in 1937.